We talk a lot about burgers here. They're delicious, and we love them, and anyone who doesn’t just needs to go. We’ve uncovered the most underrated burgers, went on a quest for the city’s best classic burgers, sought out the best burgers by ‘hood. Hell, we even put together a 25-deep burger bucket list. 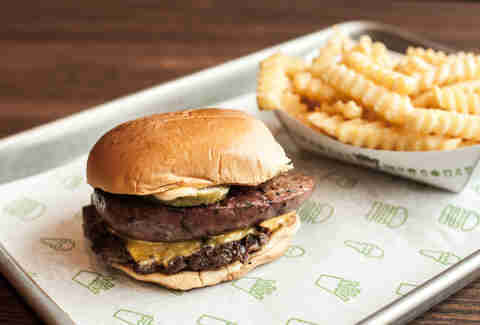 But because the burgers never stop, we’re bringing you our current picks for the best burgers in the whole damn city. From diner-style griddled patties to modern monsters stacked between grilled cheese and honey buns, these are the best overall burgers you need to be focusing on right now. These burgers -- made with Black Angus beef ground daily -- are worth the late slip to work. You can’t go wrong with anything in the lineup, but get the Detention if you’re feeling anything like that bully who used to give you wedgies in third grade. That’s two beastly patties smothered with cheddar, bourbon-glazed “tipsy” onions, and all the fixins. Oh, and all of that is stuffed between made-from-scratch buns fashioned out of bacon grilled cheeses. Obviously. Burger purists can definitely get behind Hubcap’s hand-formed, crisp-seared patties that sit pretty between buns made specifically to withstand the inevitable drips of grease. They are near-perfect as is, but to double the pleasure (and the fun), we suggest going with a twice-the-beef, twice-the-cheese monstrosity. The decker gets stacked in true decker style, with a slice of crisp bread, special mayo, and lettuce, tomato, onion, and pickles layered throughout. This burger is so ridiculously good, it’s almost criminal. No, but really, it’s actually kinda criminal. 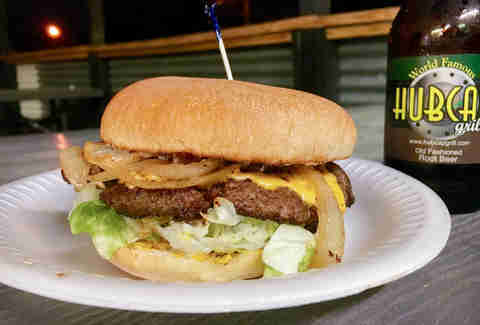 When Underbelly started serving a "UB Double Double", the resto was served a cease & desist letter courtesy of In-N-Out. A quick name change later, this double-cheese, double-beef burger, now found full time at The Hay Merchant, is as juicy and legally delicious as ever. That’s because the beef is ground fresh straight from UB’s in-house butchery. With LTO and house pickles, we’d choose this guy over the one from a certain uptight chain every time. For a damn fine burger with a little side of nostalgia, hit this neighborhood champion of all things beef. The family-run grocer has obviously been doing something right, because it's been keeping Houstonians well-fed since the '60s. While you can go full throttle by loading your loosely packed, properly crusted patties with stacks of candied bacon and hash browns, you should really start by getting a taste of the burger that started it all. Like the reptilian Star Wars beast for which it's named, this 10-napkin burger’s only desire is to FEED... feed you, that is. Made with half a pound of aggressively seasoned Angus, this beef-bomb is crowned simply with cheddar, smoked bacon, and a fried egg, because in today's crazy world, that is simple. Take the Rancor down alongside one of the city’s more impressive lineups of craft brew. Our burger expert, the venerable Kevin Alexander, ran around Houston eating a bunch of classic cheeseburgers in order to find the best of the best. Well, he didn’t actually run, because the thought of doing that and eating nine burgers makes us physically ill, but you get the point. In the end, he crowned the long-running bayside burger institution’s perfectly thin, peppery crusted & smashed patties the winner. 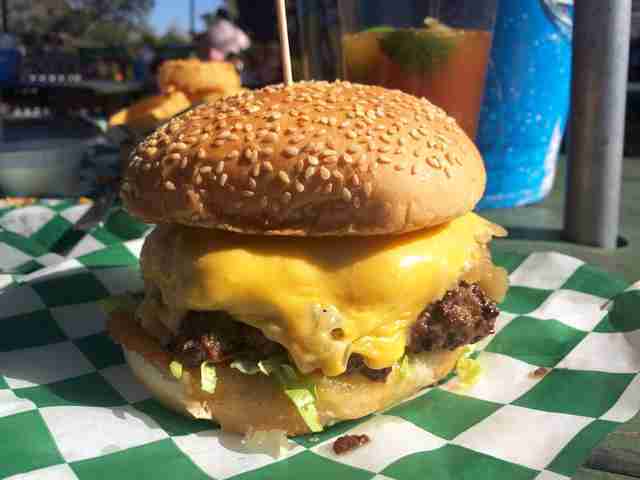 The burger is best enjoyed out on a picnic table next to bikers and old dudes in Tommy Bahama shirts. Trying to destroy your diet? Look no further than this insanely bad-for-you, but oh-so-worth-it beef bomb. We’ll lay it out for you: one mouthwatering beef patty; a pile of crisp, fatty bacon; some sliced jalapeños; an oozing fried egg, and a mountain (not a Hound) of macaroni and cheese. Bring cash and make sure that roll of paper towels is full before you sit down. 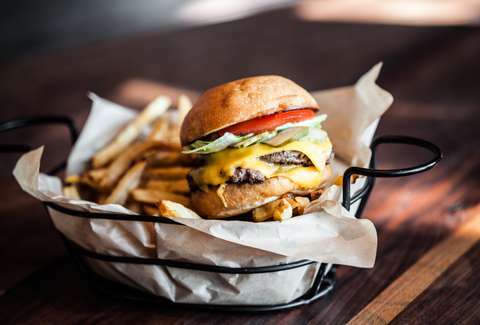 Since they’re fresh-formed, expertly seasoned, and locally sourced, allllll the burgers at this meat resort have that Texas beef swag (even when smothered with mac & cheese). Get what you please, but if you want to go balls-to-the-wall, the Grease & Weasel is the way to go. Why? Because the half-pounder with seriously thick bacon and melty cheddar cheese comes sandwiched between two griddled honey buns. Since you’re obviously watching your weight, you’ll also want some pickle chips on the side. 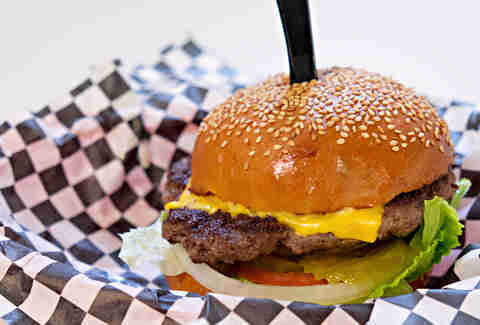 Despite its hidden location (hint: It’s inside the Greenway Plaza food court), Kuma Burger is a city-wide favorite. The fresh, umami-packed burgers are pure pleasure thanks to a crisp griddle and schmear of soy and shiitake sauce. Take things to the next level by going SPICY!! !, which means your burger will be made with three kinds of jalapeño, house sambal mayo, pepper jack cheese, and soy-marinated serrano chiles, plus additional add-ons like bacon and egg because this is Texas and we like gluttony. Smashed 10oz all-natural chuck and brisket patties are cooked to a just-pink center (unless you request otherwise) at this newly opened burger joint from the king of all things beef, chef Ronnie Killen. The beautifully salted, aggressively seared burgers don’t need much more than American cheese, crisp lettuce, dill pickles, and off-the-vine tomatoes. What they do need, though, is a side of JJ Watt-approved fried cheese curds and impeccable house-cut fries. 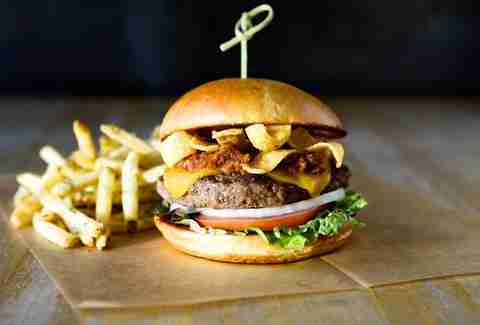 Because when an all-star burger shop moves in from Austin and offers all-natural burgers topped with all the adornments of a Frito pie, you get it. Such is the case with the Terlingua -- an Angus beef bomb smothered with chile con carne, cheddar, Fritos, and “sassy sauce,” which is a mind-numbingly good combo of mayo, mustard, and horseradish that sings alongside all that beef. You may need to get this one during off hours, because the burger bar is known to draw a crowd. This NYC import’s classic cheeseburgers are damn near perfect as is. But this is Houston, where everything is legitimately bigger, and therefore, better. 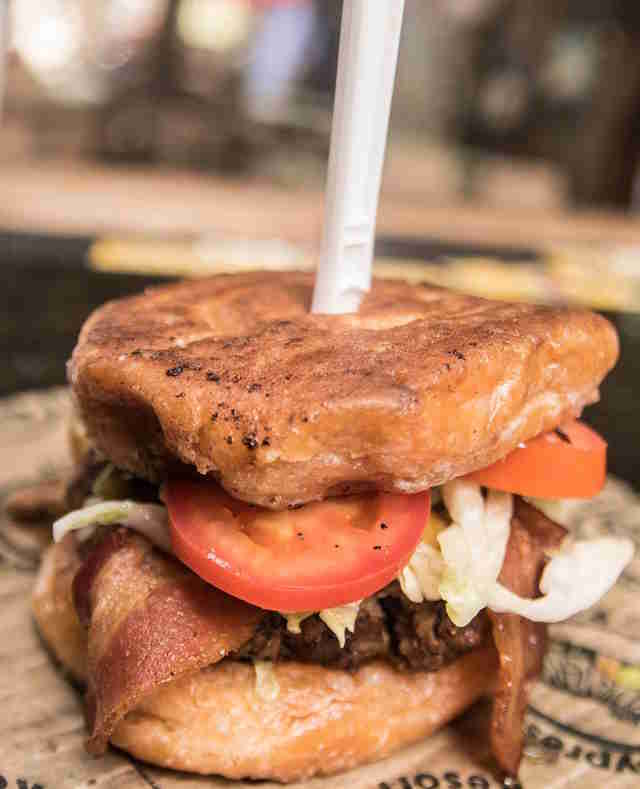 Take the Texas-exclusive Lockhart Link Burger, which is ostensibly a Shack Burger topped with pickles and an entire griddled jalapeño cheese sausage link from the indelible Kreuz Market. When one of a restaurant’s operating partners is a successful restaurateur with concepts spanning the city (Ken Bridge of Delicious Concepts), chances are said restaurant is going to be a hit. When the other partner (Felix Florez of Black Hill Meats) has his own ranching operation that supplies the country’s finest chefs with humanely raised meats, things get even more exciting. Tack on the fact that the restaurant reps an in-house dry-aging locker and masterful butchery program and you end up with not only a damn good restaurant, but a damn good namesake burger. 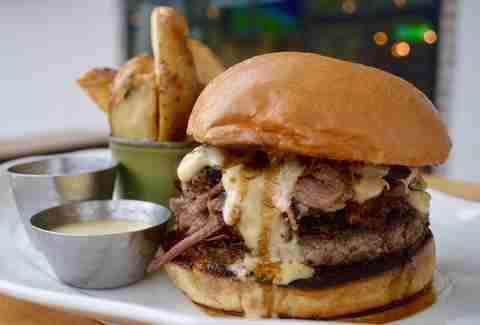 The 1/2lb Ritual Burger gets the deluxe treatment with a bone marrow glaze, a big ol’ pile of smoked brisket, velvety Deep Ellum blue cheese fondue, and caramelized pit onions. Order it medium rare and don’t forget to break out the napkins. With new digs and a much-welcomed liquor license, Kitchen 713 is a way hotter iteration of its former self. With the upgrade comes some brand new burgers, made sloppy with 8oz of Angus, white Cheddar, and slaw. The pièce de résistance is, of course, the hunks of tender and succulent green chili pork generously piled on top. The burger is available during lunch hours only, so come prepared for a late-afternoon nap. If there was ever a time to knife and fork a burger, it’s now. 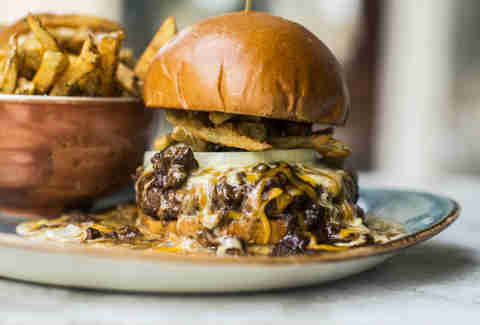 This chili cheeseburger at State Fare might be a colossal mess, but it’s worth every bit of necessary cleanup. Ancho and pasilla chiles bring life to the earthy Texas red -- no tomato or beans, here, just a slow-burn from the chili paste, aromatics, and hand-cut chuck beef. A healthy glug of hatch chile queso blanco, some extra shredded Cheddar, and crispy fried jalapeño strips make you almost forget there’s an 80/20 Akaushi burger providing the base. Almost. Perhaps throwing bacon atop a burger patty is enough to keep you happy, but maybe it’s time to rethink that because at this porcine palace, bacon makes its way inside the patty, changing your burger notions forever. Here, house-cured swine gets ground and mixed with brisket and chuck, forming a patty that’s luscious, porky, and beefy all at once. The juice-dripper is finished simply with American cheese, house-made pickles, and the Bacon Bros. special burger sauce. Get that. 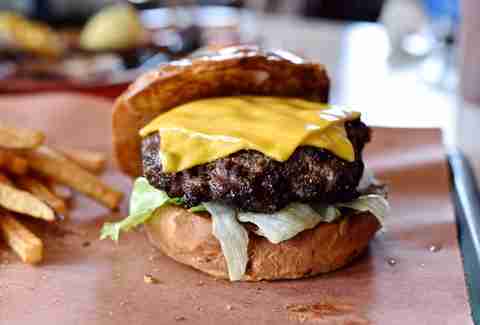 Brooke Viggiano is a Houston writer who dreamed of burgers the entire time she was writing this. See what else she dreams about @BrookeViggiano.